I love the dishes opposite, pancetta and rosemary-crusted rack of lamb with spinach, sultanas and pine nuts, which makes a special Sunday roast with a really Italian flavour, and the dessert, summer millefoglie, which follows it perfectly. Enjoy! Preheat the oven to 210°C/425°F/Gas Mark 6. Heat the oil in a large frying pan on high. Cook the lamb racks one at a time, for 2-3 minutes, turning until browned all over. Remove from the heat and cool. Place the pancetta in a food processor and process until a paste forms. Transfer to a bowl. Add the garlic and thyme and mix well. Press the mixture over the upper side of lamb. Bake for 20 minutes for medium-rare or to your liking. Cover loosely with foil and rest for 5 minutes. Meanwhile, melt the butter in a large frying pan on a high heat. Add the sultanas and cook for 1 minute. Add the spinach and cook for 2 minutes, until wilted. Season well and stir through the pine nuts. Carve the lamb into cutlets and transfer to plates. Drizzle over with the pan juices and serve with the sultana, spinach and pine nut mix. Whip the fresh cream with the icing sugar and vanilla seeds. Put the milk and the vanilla pod into a small saucepan and bring to a boil. Meanwhile, in a large bowl mix the egg yolks and sugar until pale and creamy. Then fold in the flour and stir. When the milk boils, remove it from the heat. Add it, a little at a time, into the egg mix, stirring constantly until all the milk is incorporated. Filter the liquid through a sieve and return to the heat. Cook on a gentle heat until the sauce thickens. Then cook it for a few minutes. Transfer the sauce to a clean container and refrigerate immediately. Place the puff pastry discs on a flat oven tray lined with baking paper. Pierce the disc tops with a fork to make lots of small holes. Brush with the egg wash and bake in the oven for 4-6 minutes or until golden. Remove from the oven and allow to cool. Then with a sharp knife cut the discs in half. and crème pâtissière and scatter with berries. Cover with the “lid” and repeat the process. Serve garnished with the icing sugar and mint. 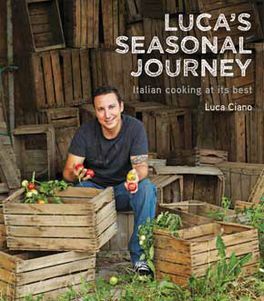 Recipes taken from Luca’s Seasonal Journey by Luca Ciano (£19.99, New Holland), photographs by Steve Brown. To order your copy, call the Express Bookshop on 01872 562310, send a cheque or postal order made payable to The Express Bookshop to Express Bookshop, PO Box 200, Falmouth, Cornwall TR11 4WJ, or order online at expressbookshop.com.